I’ve written a lot of reviews over the past two years about what streaming devices to buy, but I’ve never come out and said that you shouldn’t buy a particular device. I worked in consumer electronics retail with Circuit City for a long time – over ten years, in fact. We were always taught to ignore our opinions on a product and just pitch its features and benefits. If any of you are in sales, you’ll understand what I mean. Most products were beneficial to at least some customers, even if we didn’t like them. Occasionally, we came across a product that is just so bad, or so overpriced that you really have to wonder what was going through the manufacturer’s heads. Are they trying to rip off their customers? Or are they just out of touch with reality? And this has to do with Android streaming devices how, exactly? I’ve heard about SmartKodi from a few readers, and even the people over on the Kodi forums. I’ll give you a spoiler, their opinion of the company wasn’t at all good. But, I decided to check them out for myself. So sit back, and let me explain why you shouldn’t buy the SmartKodi Smart TV Box. You can find out about SmartKodi at SmartKodi.com. I won’t link to the site because that may indirectly help them out, and that’s definitely not my purpose here. All of the images in this article were taken on September 6th, 2015 and were accurate as of the time of this writing. What streaming device is worth $325??? I’ll just leave that price tag here and let you consider that for a minute. But wow….$325 for a streaming device is just a lot of money. Look at it this way, you can get an NVIDIA Shield, AND a WeTek Play and still end up paying less than the SmartKodi box. It must have some cutting edge hardware right? format support, better video playback performance, and great image quality on your TV. But wait…didn’t the ARM A7 come out back in 2011? Even ARM themselves list the Cortex-A7 at the bottom of their processor listings. It ranks only slightly higher than the basement-dwelling Cortex-A5. Sure, the ARM A7 is a good processor for power-efficient devices like wearables or phones and tablets. But unless the SmartKodi box has an internal battery that is somehow missing from it’s spec sheet, I don’t understand why they would choose a high-efficiency processor over a high-performance processor. Surely there’s more to it. Hmmm…I wonder what a comparable Android streaming device should cost? I started out by looking at the specs and tried to find a similar device. Then I realized that SmartKodi actually did smart shoppers a favor. Their marketing page uses very specific language to describe the benefits of their CPU. I wonder if there are any other devices that also use a Specialist (sic) HiSilicon Chipset. I didn’t have far to look, actually. 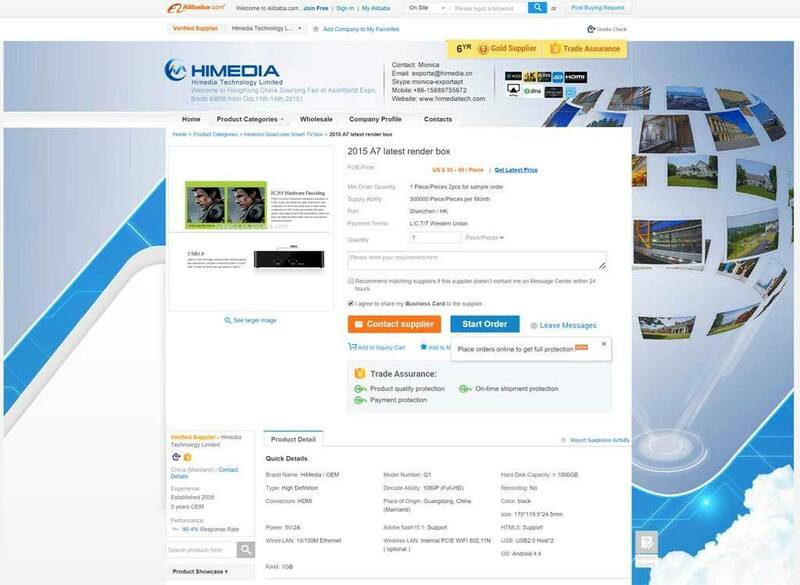 or the device’s product page from HiMedia here. SpecOut.com lists the full specs here, in case you still have your doubts. Looks pretty similar, right? Especially when you look at SmartKodi’s description again…. Ok, so now that we’ve established beyond any reasonable doubt which device this actually is, how much should it cost for the hardware itself? The HiMedia Q1 quad-core streaming device is available from Alibaba for between $35-$40 per unit. That’s for distributors, resellers and bulk purchases. But you can get it from AliExpress for $51, or $83 after shipping. 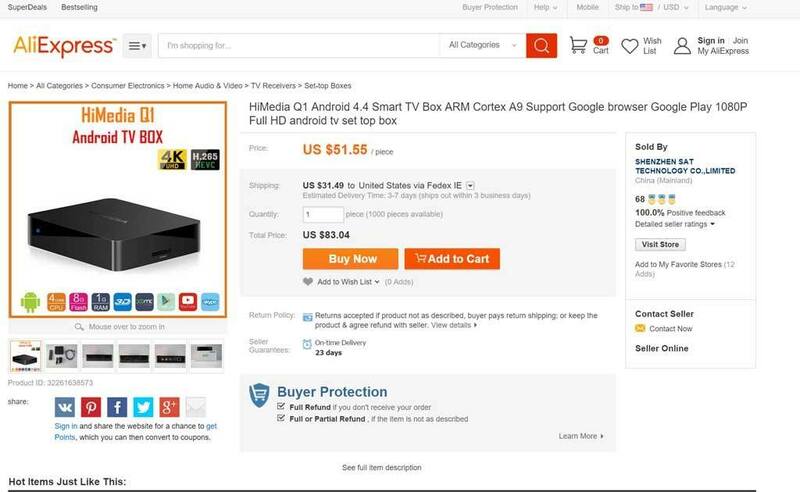 The description on AliExpress lists it as a Cortex-A9 in the heading, but if you scroll down it will actually list it as a Cortex-A7 everywhere else. Does SmartKodi offer anything extra to justify the obscene markup? One year premium support. OK, I’ll admit that is a benefit to a lot of people. They don’t say exactly what “Premium Support” is over “regular support”, but I’ll give them the benefit of the doubt on this one. Other than that, they don’t promise anything that they can control. Things that are “Free for a lifetime” usually have a very short lifespan. 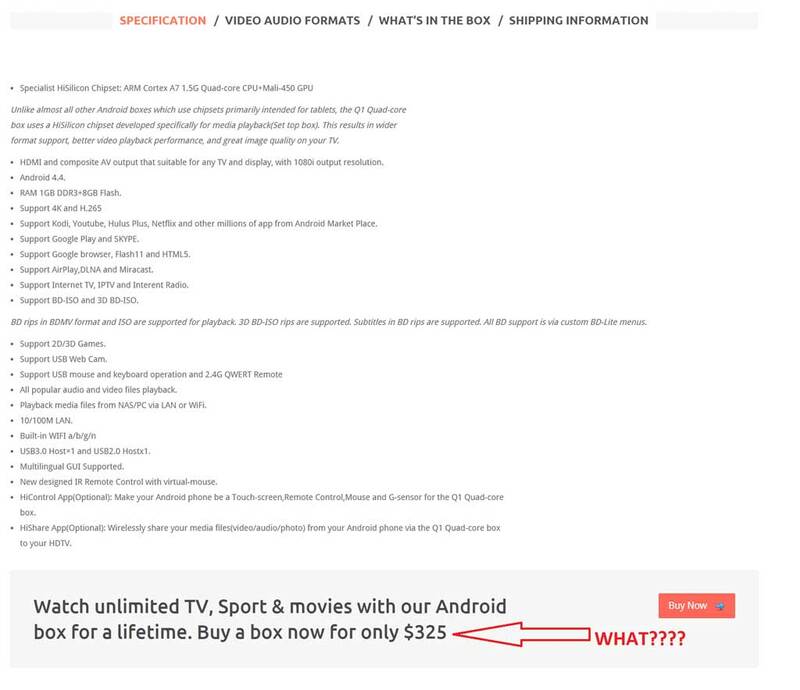 That’s something that you’ll see a lot of unscrupulous Android TV box sellers promote. They can’t sell you on the benefits of the hardware, because the hardware they’re selling is old and past it’s prime. They sell you on the ability to get third-party add-ons to Kodi that will let you stream content, possibly illegally, from the Internet. I’m not here to argue on the legal aspects of some add-ons. You’re presumably an adult and can make your own choices. But I will say that devices that push this as a “benefit” to their product over any other product are at the mercy of those paid Kodi add-ons. If the add-on suddenly stops working, then that device you overpaid for is instantly worthless. I’ve already put out a list of my favorite Android streaming devices, so that’s a good place to start. These are all from reputable manufacturers who develop the hardware that can run Kodi, Plex or whatever other media center you want. If you want to get third party add-ons, you can do that too. There’s nothing that will stop you. But you shouldn’t have to pay $325 for a device that should be a fraction of that cost. Have you used the SmartKodi device? Do you have another company that you think ripped you off? Tell me about it in the comments below! I’d just like to say, this review really made my day. As a team kodi member, possibly the worst part of boxes like this and the crap from Matricom is that those companies NEVER provide support. So when the addons invariably break, users have no recourse but to come rushing to us, where we are required to say that we don’t provide support for illegal addons. And then users get to either try to find the dev responsible for the addon or give up on a wasted purchase. Thank you so much for this comment. I was on a much-needed vacation when you posted this but I literally cheered when I saw that you commented. It really means a lot that both you and Ned like the stuff I’m writing about Kodi. The reason why the box cost $325 is because it comes with a lifetime membership to streamlive.to an online cable company of sorts which provides streaming tv channels. You can also purchase a lifetime membership without the box for a one time fee of $300. And the site is already gone! So many people think “lifetime” means their lifetime, not the product or service lifetime. On a technicality, anyone who fell into the “lifetime membership” trap did get their lifetime subscriptions. The lifetime of the site, that is. Hi Courtney. Exactly my point. Thanks for the comment! This would be so much easier to reply to with a period someplace in your comment. I agree that cable companies charge ridiculous amounts for service – most of it for stuff that we’re never going to watch anyway. But, to pay this much money for a TV box, when you can literally buy the same device for under $100 is just insane. The “service” that they provide is 1) something that you can get much cheaper, if not free, from other companies, and 2) on the shady side of legal in many countries, and 3) not something they directly control. That “service” can go belly-up and then you’re out of luck. Not worth the risk, but if you want to take the chance that you may be throwing money away, then go for it. You said. “This would be so much easier to reply to with a period someplace in your comment.”…Lmbo…hahahahahaha!!! It looks like this article is trying to analyze the hardware of the box, instead of the content of the box. An MSRP of MXQ box is around 65 USD on Amazon and the SmartKodi.com seems expensive in terms of hardware but maybe you need to read the description again. You will get the lifetime subscription for free, from streamlive.to, one of the biggest and most channels site in this world. All of other boxes out there are sold for 0 content, and this SmartKodi.com box is equipped with all the content you can watch for the rest of your life. I hope you read the site description again before posting your reviews. A dump person should also see this is a good deal. Why paying Dish or directv 300 usd per month, while you can get it for a lifetime? I feel like I’ve said this before, but anything that is offering a “lifetime subscription” better have full control over how long they’re going to be in business, otherwise you could be throwing your money away. And the plain truth is that Streamlive.to doesn’t have that control. If you think they do, then you might want to read up on Aereo, and how the US Supreme Court essentially killed it off due to copyright violations. You can take the risk that a) Streamlive.to won’t get sued andor shut down or b) that the service won’t be down when you want to watch TV. You can take those risks. I don’t think it’s worth it. My mom bought this box and she is not getting support from them. The box doesn’t work anymore. The company will not provide any warrenty info. They are advising her to pay for another device. It’s crazy. The company wants your money and then doesn’t care what happens next. I want to formally complain. Where do I start? For starters: File a police report by going to your local police precinct. The reason why your mom paid hundreds of dollars for that “Kodi Box” is because she was promised that she was going to be able to watch TV, All Movies and TV Shows for free forever and that there was going to be a company to have her back in case if anything goes back. It is obvious that she is not being attended to. But the kicker here is: She was sold a device that was pre-loaded with plugins for Kodi was offers pirated content, and while it might be legal to stream anything provided that you aren’t downloading it, just streaming it as its gone the minute the player finishes playing the movie, it most certainly isn’t legal for anyone to sell such capabilities for profits, so that in essence makes it a “theft”, because otherwise this box should have cost just $65 tops and then you get to put all those kodi addons manually yourself. Yes you would be required to do your homework and yes you would have learned something new that you could have replicated it yourself many many times over to not only help your self but to assist your friends and family in the installation of these plugins so that they would fall victim to the “Kodi Box” ripoffs. Next: File a complaint at consumer’s report. Next: File a complaint with that agency in charge of handling fraud, I think its the FTC. Next: File a complaint with the FBI. Since you received that box by mail, then possibly mail fraud was committed. Next: File a complaint with the US postal inspector. Next: head over the BBB and file a complaint there. I know that most certainly they most likely aren’t registered with the BBB, but that doesn’t mean you cannot file a complaint there for anything. Next: You do more googling to see where else you can file your complaint at, but you never give up. Everyday you perform even more googling to see where else you can file/write your complaint at. When you are done with filling complaints, you might want to create a lengthy blogger article warning others about this company, explaining your distasteful experiences with this company in detail, the more of these articles you can create in regards to your experiences and feedback regarding the matter, the better. Never give up writing the articles, make it a daily habit for the rest of your life, until you get what you want, and that’s where you would stop. Finally: Hope and see if all of your complaining efforts finally pays off and you can get a refund or proper compensation. Sales reps are snake oil salesman. I hope they take a sleeping pil and a laxative all in the same night. Hi everybody, I live in the UK and what I believe that Mr Wells is saying is true. His opinions may be based on the hardware but that is the most essential part of any box regardless of the content. If any part of the hardware fails it doesn’t matter what the content the box comes with because you will not be able to use it anymore unless you get a new box to do so. The content of the box relies on the box being able to run and continue to do so when upgrades take place and it relies on the box being able to be updated to run the new upgrade. The box’s hardware then becomes really essential, once again if you can’t run the upgraded content then it means buying a more modern and better hardware equipped box. Even more expense! This can easily be avoided by buying a suitable box at the outset and shopping around for software suitable for you to get the content you wish to watch. Outdated technology means upgrading your box more often and I for one appreciate warnings of this sort and listening to what experienced people like Mr Wells has to say. Because of advice from people like Mr Wells (and of course Mr Wells) I have now cancelled my subscription to Sky here in the UK and bought myself an android box in order to watch content provided on free programmes via the net. People like Mr. Wells deserve appreciation who go out of their way to give us all advice we can choose to heed or ignore. Well done sir! What box would you recommend? Hi Marcus, thankfully, there’s a couple of places that you can look. I wrote a list of the top ten features I’d want in my next TV box. Not all of them are right for everyone, but they’re a good starting point. There’s also my guide to the best Android TV boxes. They offer a free service and a premium subscription for 1 ,6, 12 months or “lifetime”…you can watch on their website browser based, with their Kodi addon and an android app..They have a lot of TV channels , channels I could never watch here in Germany in a good quality a linear TV service like Satellite or Cable. Everybody has to decide if it`s worth for him to pay money for a good streaming service…I`m currently on a monthly subscr. and I`m happy . I bought one of these effing things and it just plain does not work. Literally Everytime I call for support it’s “this doesn’t work anymore…that doesn’t work anymore etc etc.” You need a tram of Asbrrger Syndrome having obsessive computer nerds to keep it running. Nothing EVER stays functioning for more then a few days. It’s only worthwhile to obsessive computer types. I just hate computers. Hi Al. I’m sorry to hear how much trouble you’ve had with SmartKodi tv boxes. I don’t think it’s computers thats the problem. In my opinion, it’s companies like SmartKodi that are taking advantage of customers with deceptive advertising and then disappearing after the sale. Hi Mel. You’re welcome. I’m very glad I could help. SmartKodi is just one bad brand, but there are a lot of great manufacturers that don’t charge an arm and a leg, and support their TV boxes after the sale. Take a look at my recommendations here. And always feel free to shoot me questions along the way! 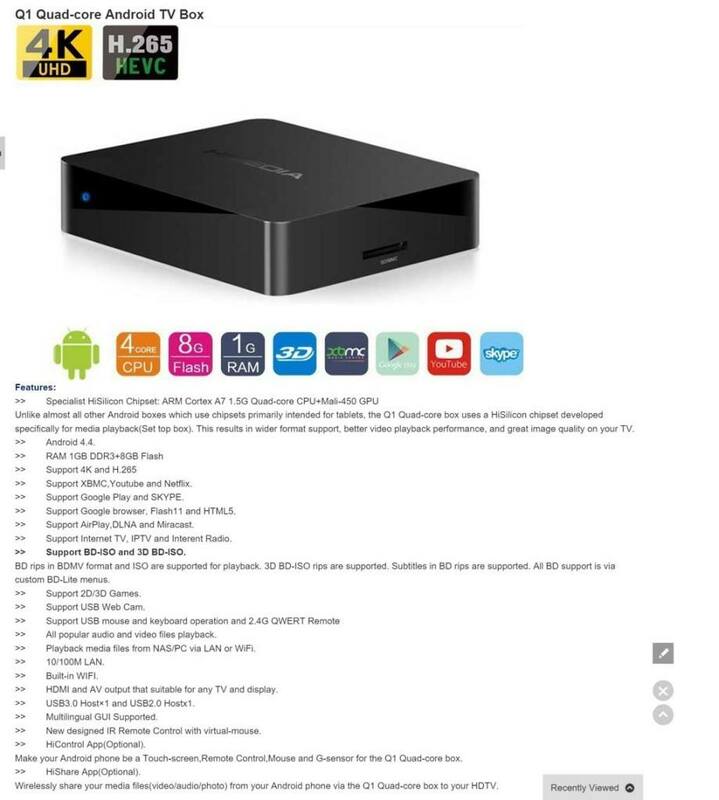 Certainly the SmartKodi streaming box is a scam…and people will fall for it. Kodi builds for sale are also scams…and people will fall for it. Kodi itself is a scam…it merely provides links to streaming sites that anyone can get to with a browser. Kodi is just a glorified bookmark tool…and people will fall for it. 🙂 I wish I could “sticky” this comment! Hi Tim! Thanks so much for the advice! Kodi devices aside, do you know of any online streaming services that provide cable channel streaming, like Streamlive.to? I was wondering if anyone has compared these online services and their reliability vs the hardware that uses them. Thanks! My mother bought the box and gave it to me as a gift. The idea is great on it. However, the more I use it the worse it gets. It slows down and freezes frequently. We are currently at a point to where you can only watch one show/movie before you have to restart the kodi add on and occasionally what your trying to watch is constantly buffering so you are watching it in segments of 30 sec pauses every 5 min. Kodi is just a library of bookmarks, half of which don’t work, the other half is a crap shoot. That’s actually the addons you’re talking about. Kodi doesn’t have any content by itself. Or…it can play your content (ripped DVD’s and music), which should work just fine. Hi, Have you encountered and reviewed MODI TV Boxes from ModTech Global? Thanks for your tips about this web site. One thing We wish to state is that often buying gadgets items from the Internet is not brand-new. The fact is, before ten years on it’s own, the market for on the internet electronic products is growing considerably. Today, you’ll find pretty much virtually any electronic digital tool along with other gadgets on the Internet, including digital cameras plus camcorders to personal computer spare parts and gambling games consoles.